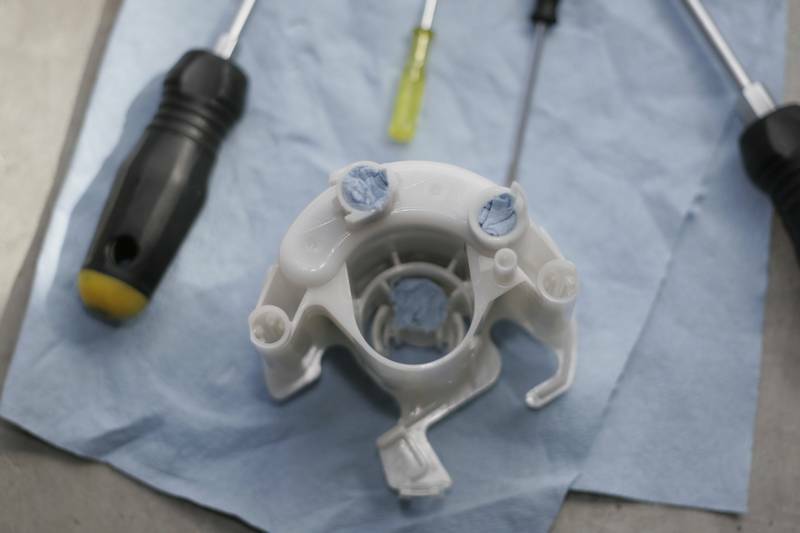 Install guide for those looking to upgrade the factory WRX, STi, or LGT fuel pump. 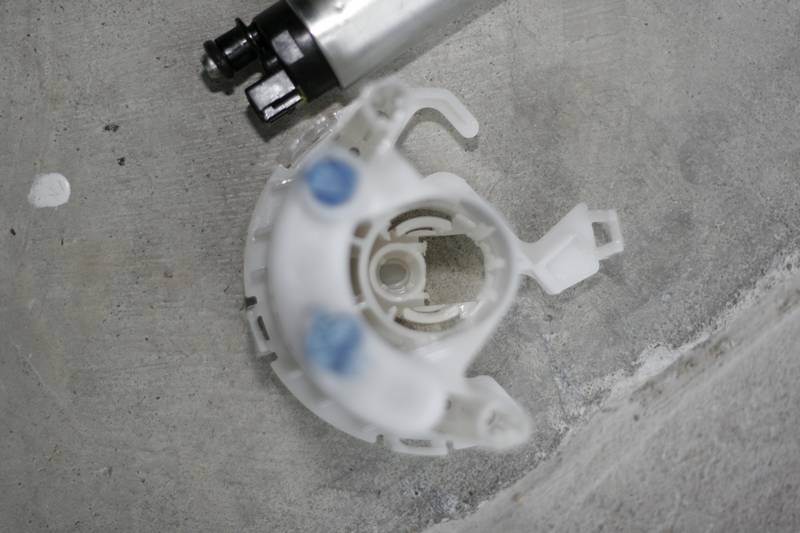 I recently found the stock pump to be inadequate when running high boost and E85 with my DW850's. 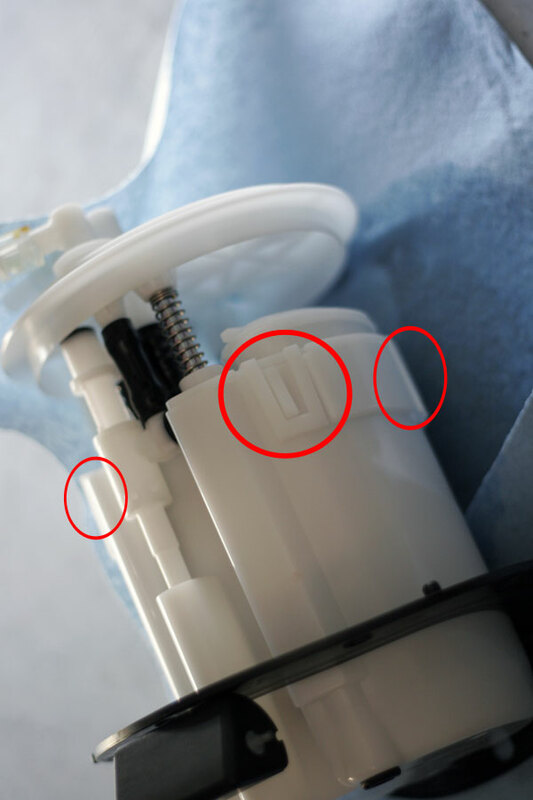 When ordering the pump, you DO NOT need the filter kit, it WILL NOT fit in the housing. Make sure to run the car down under the 1/4 tank mark before beginning. There will be gas spillage so make sure you have plenty of fresh air and towels around to clean up. 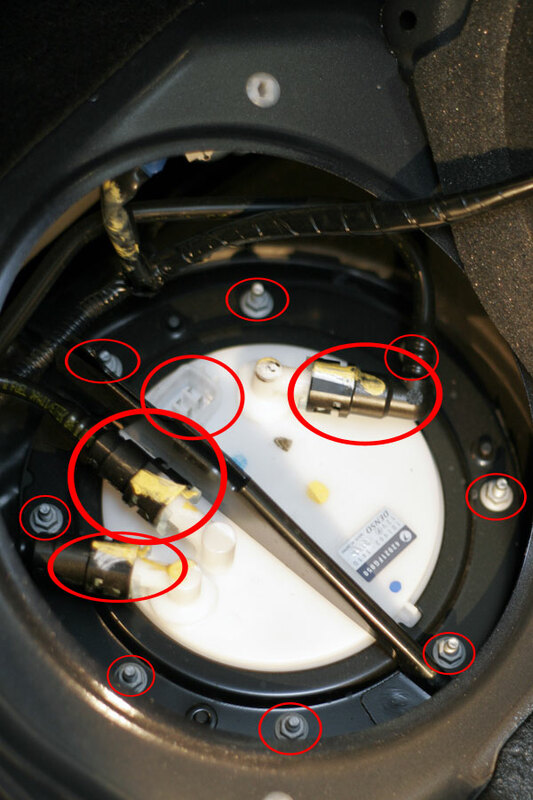 Pop the gas cap off to relieve fuel pressure from the tank. Remove your lower rear seat by pulling upwards on each side and the middle. There are 3 snap in spots. Place your seat somewhere clean and out of the way. 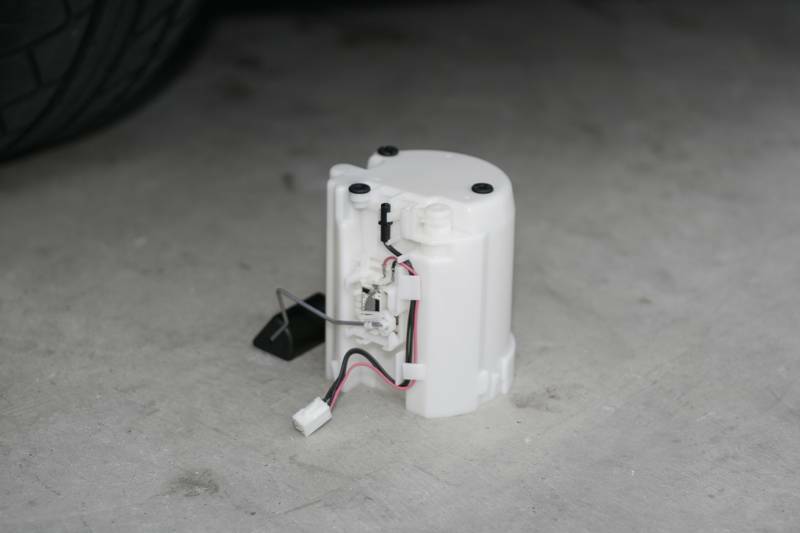 Once you do this you can see the Fuel Pump access cover and harness. Unplug this harness. 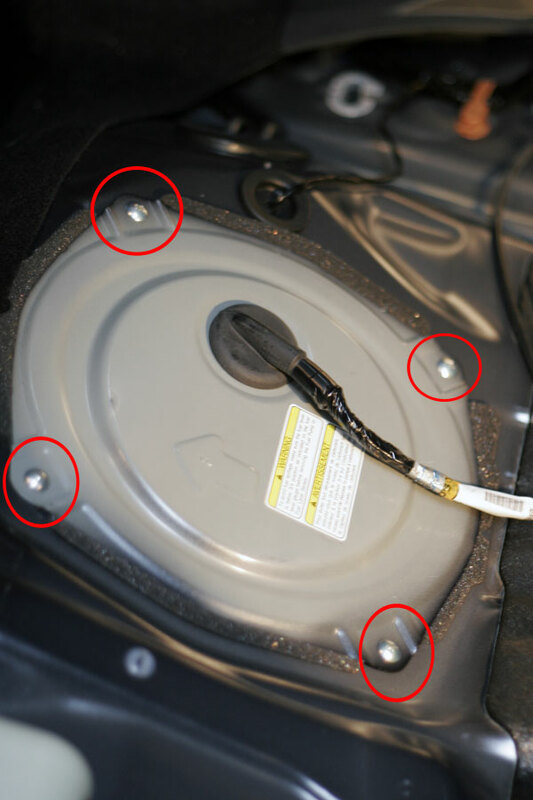 Remove the 4 screws holding the access cover in place and place them somewhere safe (away from the access cover!). 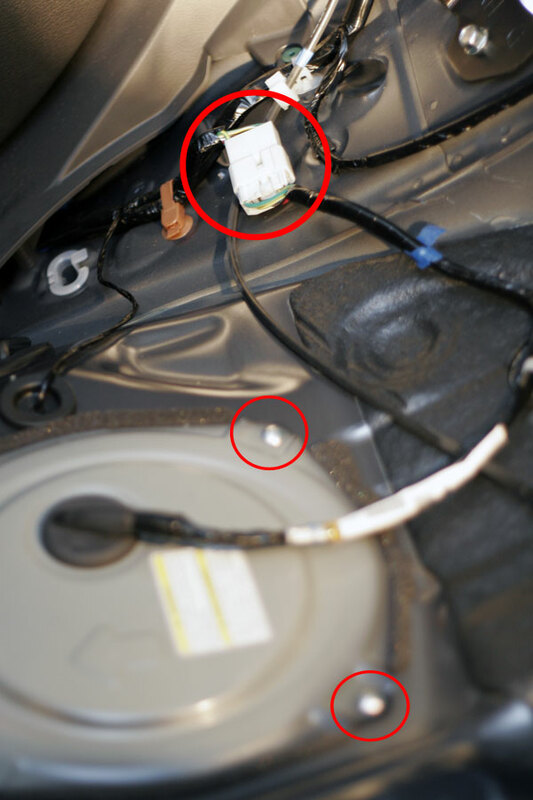 Now you can see the fuel pump access point. There are 3 fuel lines, 8 8mm nuts, and the electrical connector. Disconnect the electrical connector now and stuff it out of the way. Grab some of your handy shop towels and place them under the fuel lines incase of spillage. Once you have removed the fuel lines it should look like this. Remove all 8 of the 8mm nuts and place them somewhere safe. 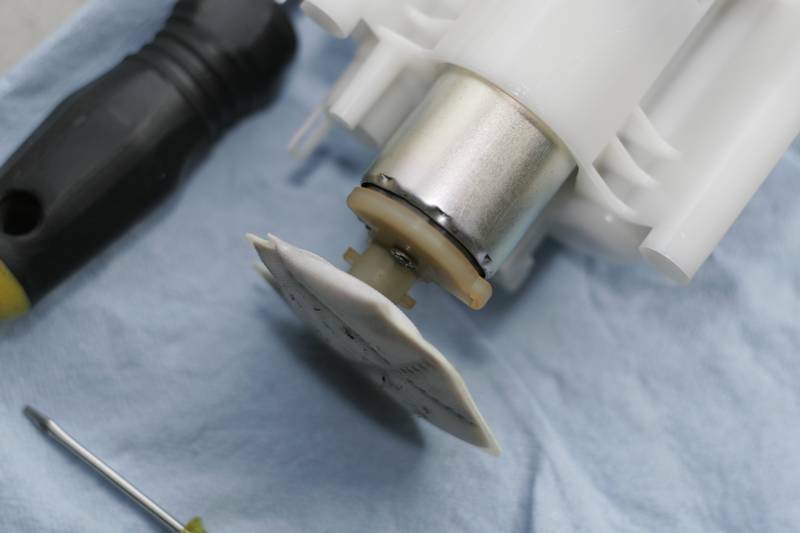 Gently remove the metal bracket surrounding the entire assembly to gain access to the housing and place it somewhere safe. 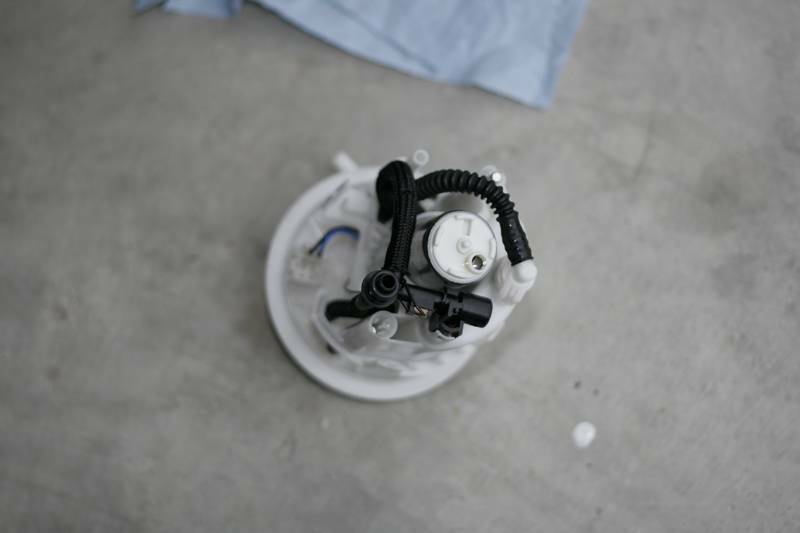 Slowly remove the fuel pump assembly by contorting it, be careful not to damage the float or sensor. Once the housing is removed it may spill, make sure you have plenty of towels laid down in your car. If all went well it should look like this. 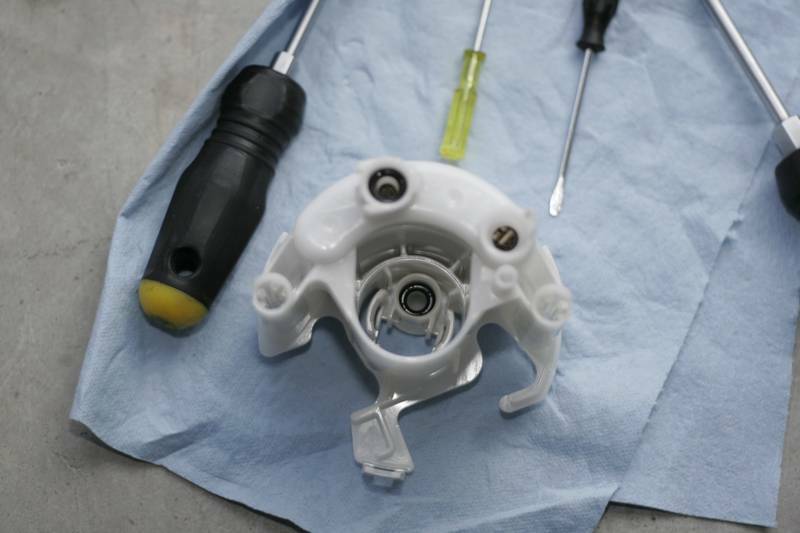 Remove the giant O-ring from around the assembly and place it somewhere safe. Next you will need to use patience and the flathead to pop all 4 tabs holding the top of the assembly off. Once you have done this, set the top piece somewhere safe. Once the tabs are loosened pry the cover off to expose the innards. 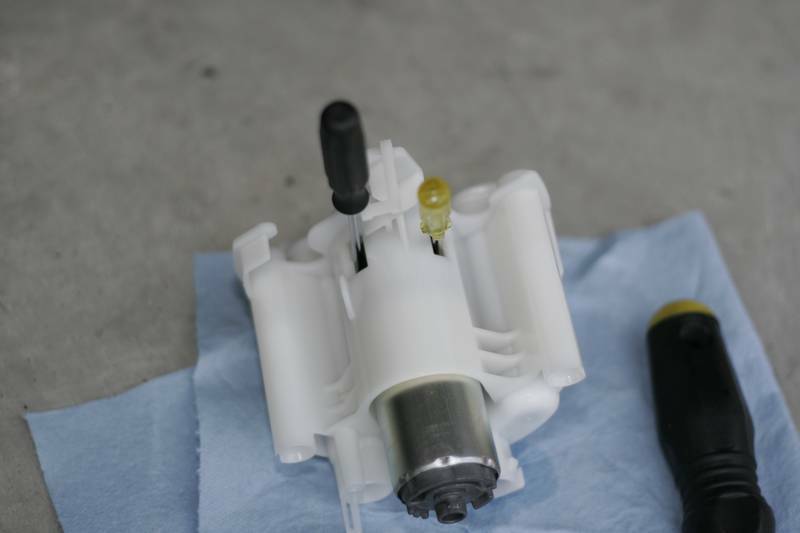 You may need to disconnect the connector from the fuel pump as well. Make special note of where the various O-rings are located for re-installation. There is a small C-clip that needs to be removed before the whole assembly can slide off. 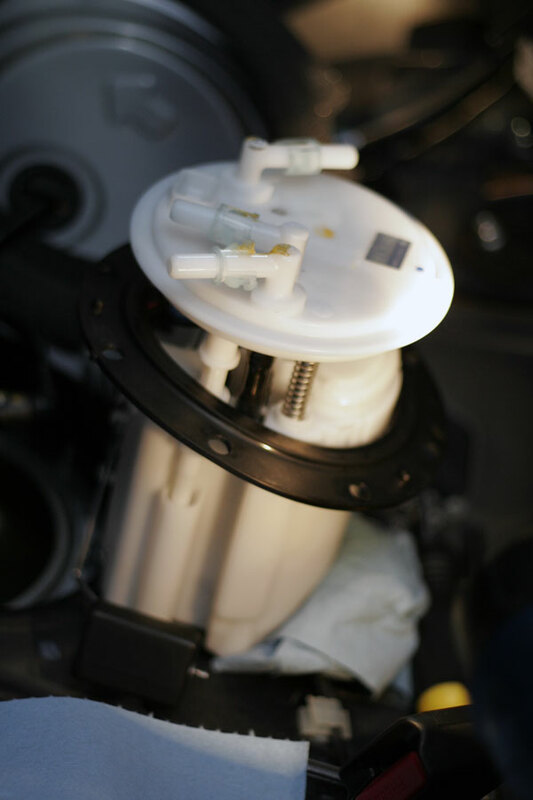 On the bottom portion of the fuel pump is a compression washer that holds the fuel filter to the pump. 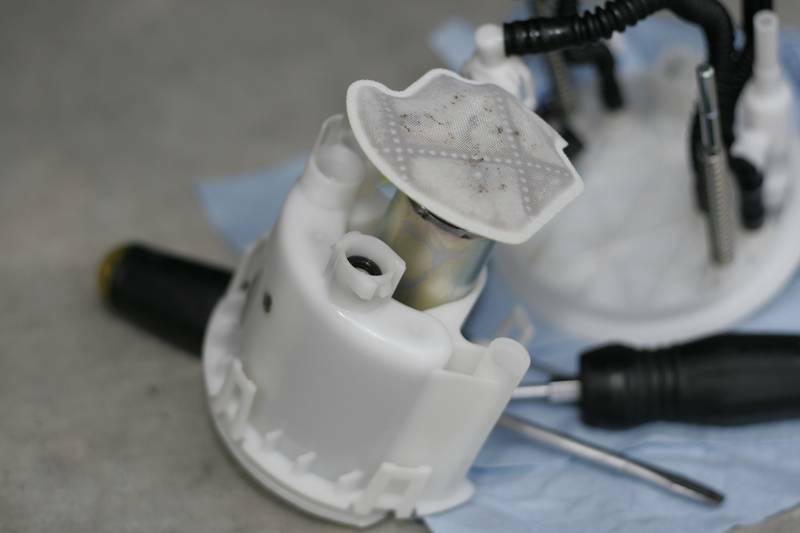 Use a small flathead to pry this off and remove the filter. Place both aside for further use later. Grab two small flatheads and shove them in the openings like shown below. 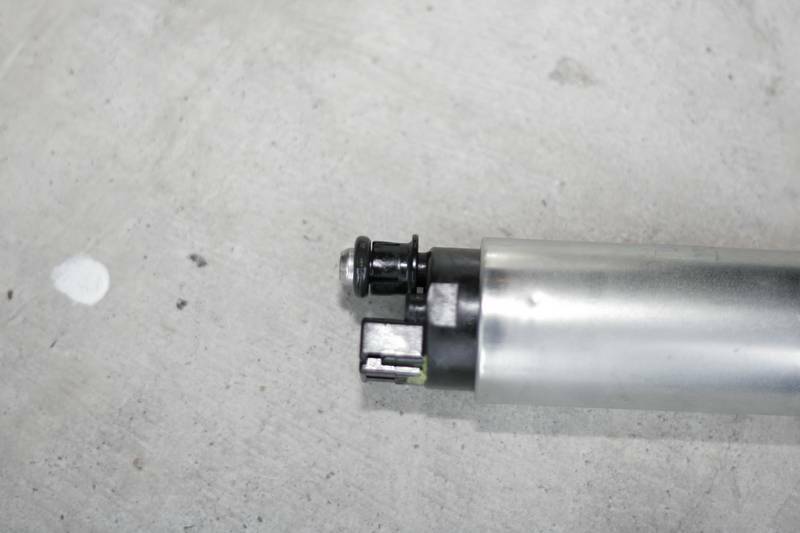 This will allow you to remove the fuel pump. It requires good force so use a pair of pliers if needed. Plug the holes with some paper towels so you don't get plastic shavings in them during the next steps. In the picture below you will see where the housing needs to be shaved down to accommodate the Walbro's size. You must shave all 5 of the spots down as far as possible so the walbro can slide in far enough to allow the whole assembly to fit up snug. I recommend using a pair of dykes first to snip off the big pieces, then use a dremel to smooth it all out. 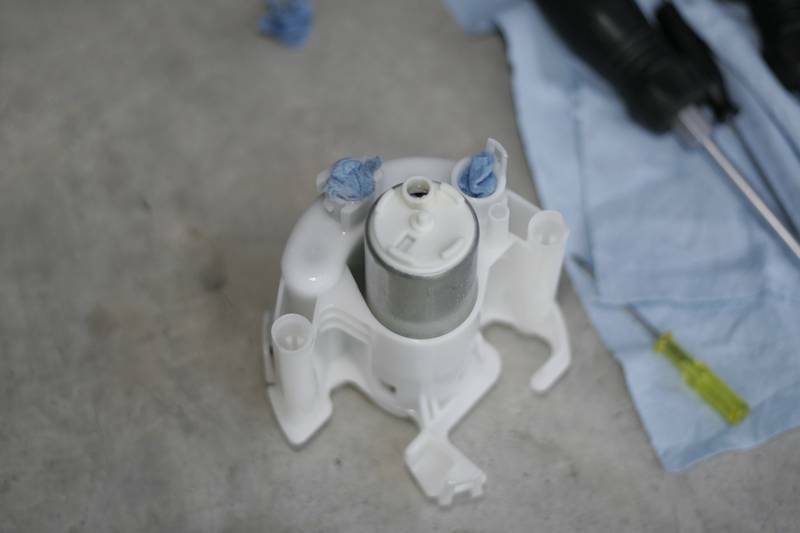 Grab the plastic stopper from the stock fuel pump and retrieve the O-Ring from the pump assembly and place them like shown below. 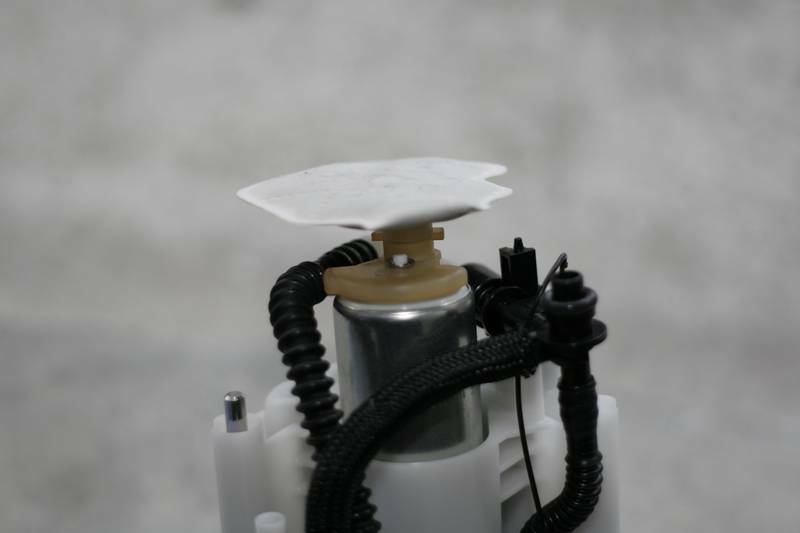 Remove any paper towels from the housing and shove the pump into the shaved housing until it bottoms out, if it doesn't seem to go in all the way you haven't shaved the housing down completely. Touch it up and try again. 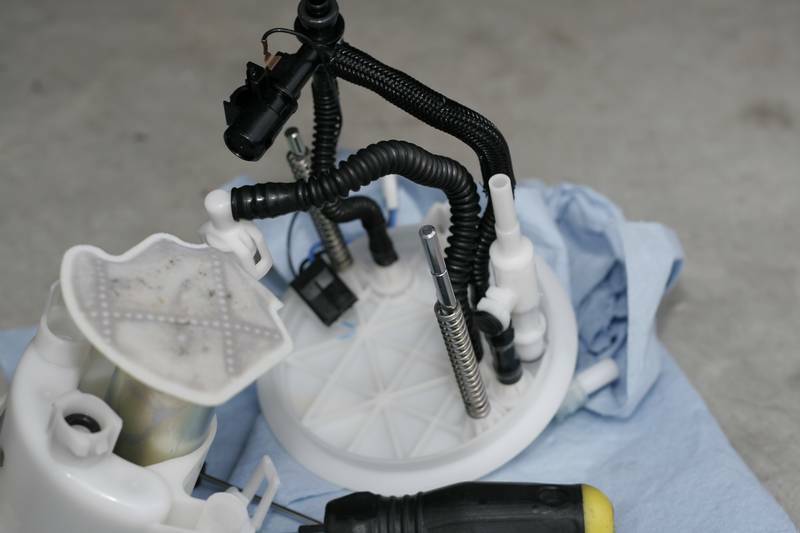 Place the big snake hosing assembly back over the fuel pump making certain that all original o-rings are back in their appropriate holes. It should look something like this since the filter has not been installed yet. You do NOT want to put the filter on until the snake hosing assembly is installed since it's a bigger PITA to get the compression washer. 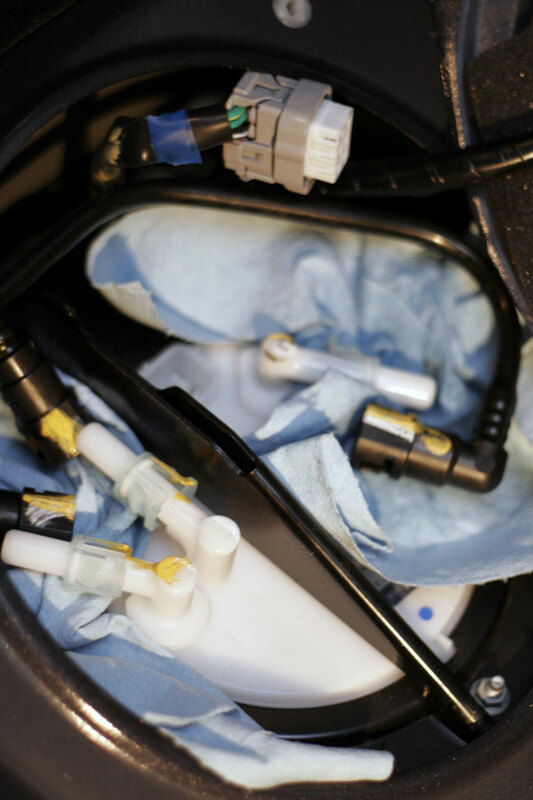 Grab the stock filter and compression washer and re-install to the Walbro. This can be tricky, I use 2 small flatheads to push and hold. It'll look like this when complete. Plug in all connections to the Pump and housings. 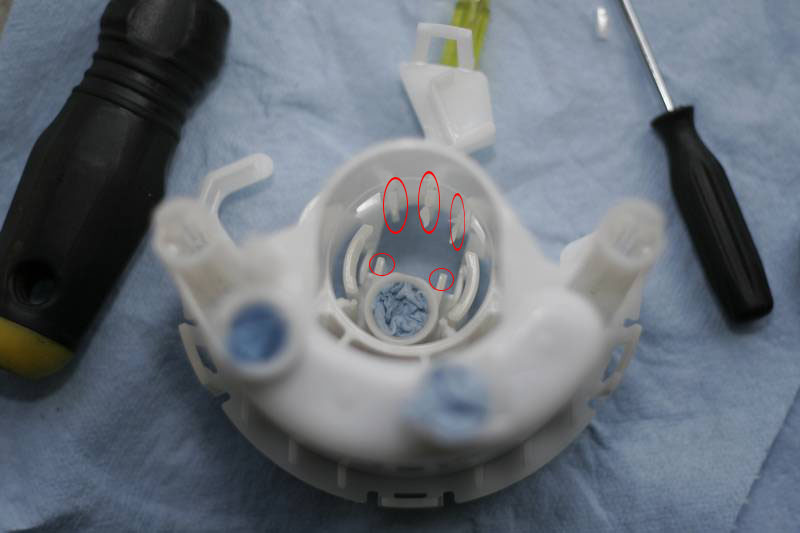 Take the upper portion of the housing and mate it with the bottom (it'll take some force). Toss it in the car in the reverse order it came out and plug in the harness. Before you start the car, turn the key on for a few seconds to let it prime the lines, then key off and start it up. It'll make some noise and might be rough for a second or two while the air is relieved. Last edited by XPT Tuning; 06-25-09 at 01:55 PM. Hey XPT Tuning, We gotten to your last step but we could not figure out how to pull the pump out. Seems like something is holding from the top like a hose but we cannot gain access. Do you have any luck to it? All, sorry for the delay I was out of the country last week. I have the rest of the pics and will be following up with the rest of the install notes shortly after catching up on emails. Awesome! I'm pumped to see more pics cause I'm gonna be doing this install tomorrow! Will be adding descriptions soon, for now the pictures are here to act as a visual guide as you power through this job!